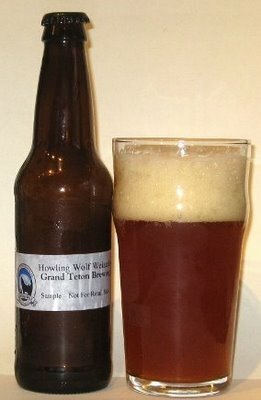 Appearance: This is a cloudy copper colored brew with plenty of carbonation. The head is a dense, well packed foam of small bubbles that leave a thin Belgian lace. Aroma: The first aroma is similar to the traditional weizenbier… slight banana and some cloves. The second aromatic impression has the slight hint of toasted barley joining the initial aromatics. The third aromatics blend the first two sensations with a hint of hop floral. Mouth feel: What we have here is a mouth-feel that is almost obese. Flavor: Between lip and sip there is a rush of banana and then the rush of refreshing coolness followed by a tsunami of banana and bubble gum. The flavors are intense… The second impression follows the first in specifics but with a warmer sensation. The third impression is more intense than the first two… I’m afraid to take another sip. Finish: It has been almost a full minute since I finished this tasting and there is still a coating of flavors on my pallet, slowly leaving a sweet, almost viscous sensation. Comments: This is one intense brew. It has the character of the Bavarian brews but the heft of a fast-food eating, live in their auto when not on the couch American. It must be noted that more is not always better. This is a sipping beer that would be best served in small tasting glasses after a big meal.